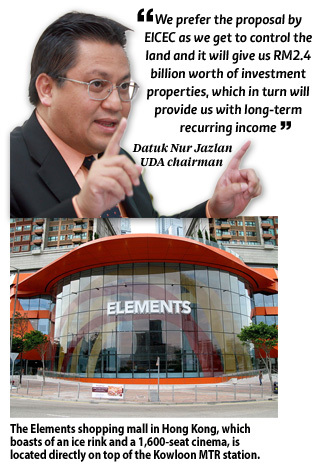 Malaysia Property News | Property Market In Malaysia: Elements model for Pudu project? HONG KONG FLAVOUR: UDA Holdings keen on Everbright International’s mall proposal as it ensures long-term sustainability. UDA Holdings may redevelop Pudu Jail into an integrated transport hub, a la Elements of Hong Kong, to attract domestic and foreign direct investments. The plan could generate more than RM8 billion in gross development value, said UDA chairman Datuk Nur Jazlan Mohamed. Nur Jazlan said the company had hired consultants to study proposals from the Ministry of Finance (MOF) and Everbright International Construction Engineering Corp (EICEC), a China government-linked company. This is also despite the MOF having rejected the Chinese developer’s proposal in favour of splitting the 8ha plot into three parcels, mainly to be given to Bumiputera developers. “We prefer the proposal by EICEC as we get to control the land and it will give us RM2.4 billion worth of investment properties, which in turn will provide us with long-term recurring income,” Nur Jazlan said. “EICEC also said it would hand over the properties to us four to five years after construction commences. The key here is money, which we need for long-term sustainability,” he added. Nur Jazlan reiterated that UDA’s survival and the fate of its 1,400 employees depended on the success of the Pudu Jail redevelopment project. He said UDA had no choice but to be competitive as it was no longer receiving any direct assistance from the government. UDA, with assets worth more than RM2 billion, is RM900 million in debt. “If we find investors with risk appetite to take on the development, we will consider them. The project has big risk and we need more than RM1 billion up front to develop the infrastructure and build the properties. “We want the development to be sustainable and, therefore, we need investors with deep pockets,” he said. The Pudu Jail redevelopment is part of the Economic Transformation Programme (ETP) under the New Economic Model to turn the Klang Valley into the Greater Kuala Lumpur economic district and Malaysia into a highincome nation by 2020.